PHOENIX (AP) There are some NBA games that are over shortly after they began. Pacers: Indiana committed a season-low six turnovers. … Opened a five-game trip through the West. 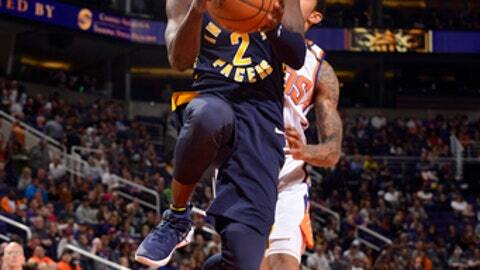 … Indiana shot 54.5 percent to the Suns’ 41.2 percent. …. Indiana still is just 8-16 against Suns since 2005-06. Suns: Warren, averaging 19.7 points per game, was a late scratch with low back soreness. … Marquese Chriss missed his second straight game with a right hip strain. … Suns’ most one-sided loss of season was 142-116 at home against Houston on Nov. 16. … Jackson made 4 of 5 shots in the first quarter, the rest of the Suns 2 of 20. … Phoenix was 2 of 15 on 3s in the first quarter. …. Dragan Bender started and was 0-for-7 shooting, six of them errant 3s, and did not score in 30 minutes. … Phoenix plays the next four and six of the next seven on the road.